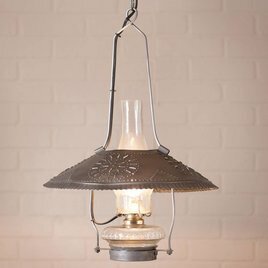 Bring back a touch of Colonial times with the Smethport Hanging Lamp in Antique Tin. This beautiful pendant is an ode to a time gone by when candlelight lit the way. 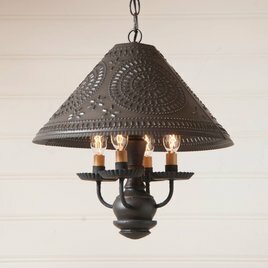 The Antique finish will be a welcomed addition to your country home. 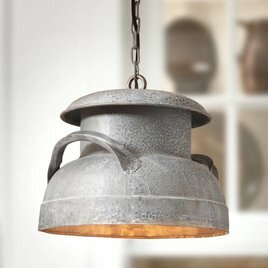 Bring a farmhouse touch to your cozy place with the Milk Can Pendant light. 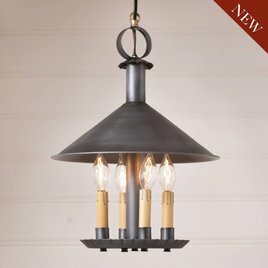 This beautiful rustic pendant has a weathered zin finish for your country home. Imagine this piece inside the mudroom or in the kitchen. 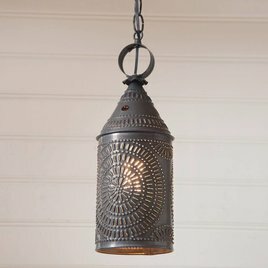 The Stockbridge Shade Light with Star is a great touch of country grouped over an island or sink area! Available in two colors. Finished with a fine crimpling on the edges and a rustic punched star design. Made in the USA. 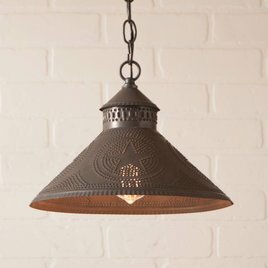 Our Homespun Shade Light features the chisel pattern, which is the signature design of our pioneer past. 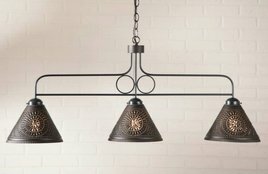 Crafted in our rustic Kettle Black , this versatile lighting accessory can brighten your breakfast nook, country kitchen or foyer. The Store Lamp is a throwback to what you would have seen over a 100 years ago. 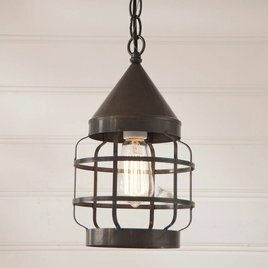 This updated version though has electric and an Antique brushed tin finish! You'll LOVE the way the light brightens a room thru the glass globe that is included. 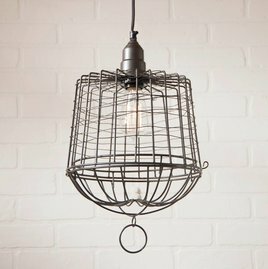 The Egg Basket Cage Pendant Light brings a farmhouse touch to any spot in your home. Baskets like this were used to gather eggs from the coop and the baskets were used to carry the eggs. Perfect over an island, bathroom sink or your favorite corner. 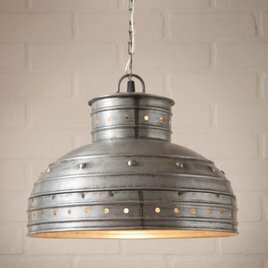 The Round Strap Light is a beautiful pendant that looks great with an Edison light bulb! It's easy to clean. Just dust with a soft clean cloth or use the brush attachment from your vacuum. Made in USA! 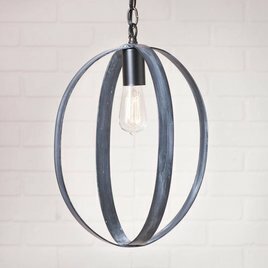 Refresh your space with the 16-Inch Oval Sphere Pendant in Black. This updated light will bring a new look to any living space. 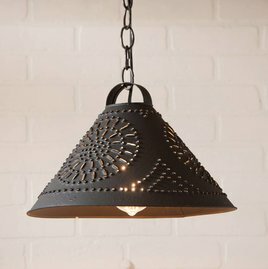 The Light is crafted from metal straps to create this beautiful pendant. Made in the USA!